So August is almost over and guess what, I saw Christmas cards at the front of Clintons cards in the middle of August! I was disgusted, the kids haven't even got back to school yet and summer isn't even over and Christmas is already being pushed into our faces!! I did express my thoughts on to their Facebook page!!! Anyway, yes another month has passed and we have another round up of my monthly beauty favourites again! Enjoy! I actually had five products to talk about but I forgot to photo it and didn't realise until I came to add my URL on to my photo, so that favourite will have to be featured another time! 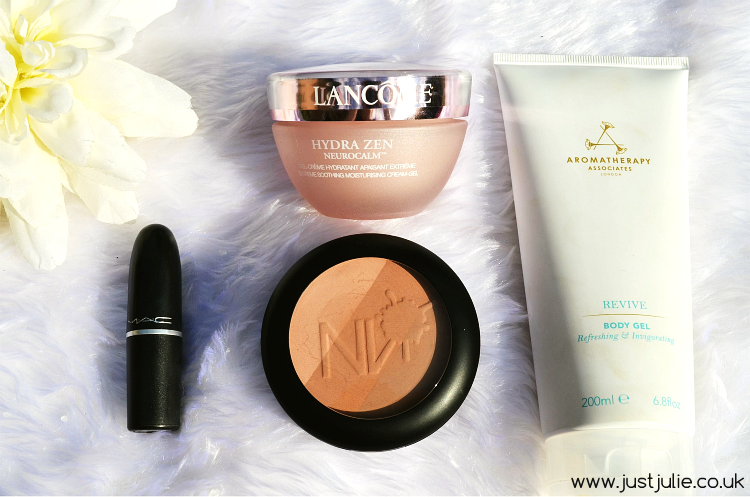 Anyway, I have some great products that I've been loving this month! Lancôme Hydra Zen Neurocalm Cream-Gel If you read My Current Skincare Routine post last month, you'll know I have oily skin, that's very dehydrated. I mentioned that I'd been using a L'Oreal gel moisturiser, which I do like BUT I ran out and no where had it in stock! Do you think I could find another gel moisturiser? Nope! Well I work opposite the Lancôme counter, it was my last day at work for two weeks and I just needed a moisturiser ASAP, and having tried a sample of the Hydra Zen Neurocalm Cream-Gel before, I knew this agreed with my skin so decided to pick it up. Yes it's an expensive purchase, especially as the L'Oreal one costs just a few pounds BUT I have to admit, this is bloody AMAZING!!!! My skin is drinking it up and leaving my skin feeling so hydrated and soft afterwards. I noticed a massive difference one week into using this, my oil was kept at bay and my those nasty dehydration lines (they're not all wrinkles) had started to disappear! I'm not lying! One month after using this and I couldn't be any happier. I only need to use a small amount, so believe me I'll be making this last! This is my best purchase of the month! Lancôme are slowly taking over my skincare routine but it's really working!!! I do have some new skincare to try so sadly this will need to be put aside for September for me to try the other brand, but I have a feeling this will be back come October! I Love this and can't recommend this enough! MAC Captive Lipstick It's not hard to love a MAC lipstick, I own a fair few and I tend to go through lipstick phases and can easily forget all about a lipstick. I needed a deep lipstick, and normally opt for a red but I browsed through my collection and found this and was like I LOVE this lipstick, why don't I wear it more often? It's a beautiful plum shade, that can suit most people. It's deep enough to wear on a night out, teamed up with smokey eyes or you could get away with wearing this during the day whilst sporting a cat flick liquid liner look. This has a satin finish, which I do like, as they tend to last well but aren't as drying as their matte formations. Since digging this out I have been wearing this a lot and always receive compliments whilst wearing it. To see how this looks, then take a peek at my FOTD#6 Evening Makeup Look that I posted the other day. NV Colour Cosmetics Bronzer in fair If you visit my blog frequently you'll know I love me a bronzer. I refuse to embrace my natural pale skin and quite frankly I just look dead so bronzer is a must have product for me! I have also had comments about bronzers suitable for pale skins. As I tend to fake tan I normally opt for a slightly deeper bronzer, so this month I have tried out a bronzer that is perfect for any pale skin people out there! I really have enjoyed using this. The bronzer comes with three shades, all virtually matte, each slightly darker than the other. This bronzer is so versatile. If I've just wanted a slight bronzed look then I will use the two lightest shades but can deepen it up slightly by adding the darker shade. I can contour with the dark colour easily too. So that's it for my August Beauty favourites, bar the one I missed out! It's always hard to narrow things down and I do like to try to talk about products that I haven't reviewed recently, otherwise we're going over old ground! Just a side note, I'm planning on TRYING to post everyday in September. I wanted to set myself a challenge so that's it. I'll be honest, I think I'm going to fail. I work full time and do have a lot on, especially at work (exciting times ahead and a post will follow at the beginning of September) so I reckon I'll miss out a few days BUT I'm going to try my damn hardest to post everyday, but if I miss a day or two, please don't hold it against me, working 40+ hours a week and blogging what 30+ hours a week and trying to maintain a social life can be hard at times but I want to give this a bash! Anyway, please leave links to your monthly favourites below or let me know what has been your favourite product or thing this month!